When Boston lawyer Abraham W. Fuller died in 1841, he left a provision in his will pertaining to Mount Auburn Cemetery. An excerpt of his will, which can be found in Mount Auburn’s Historical Collections, indicates that Fuller left the amount of $2,000 to the executors of his estate for the sole purpose of purchasing a lot a Mount Auburn Cemetery. Fuller intended the lot to be for “himself, his siblings and his remaining friends”. He also requested “a neat, substantial fence to be built” around his lot and that a “simple obelisk be erected” with “my name upon it, and any other” if appropriate. Before Abraham’s executors went to purchase a burial lot, they consulted with some of his distant relatives who happened to be among the first group of people to purchase a lot at Mount Auburn. These relatives were the proprietors of Lot #1, an ideally situated piece of land located on Hazel Path, that featured highly prized and unobstructed views of Boston, Boston Harbor and local surrounding communities. After much discussion, it was decided that a parcel of land adjacent to Lot #1 would be purchased for Fuller. This piece of adjoining land would become Lot #1556. Collectively, these two lots became known as “The Fuller Lots” and work quickly began to seamlessly weave the two pieces of land together. New landscaping was added, construction plans for the fence requested by Abraham Fuller were made and discussions about proper monumentation for the lots ensued. In keeping with Abraham’s request, an obelisk style monument would be used and a family member’s name and short biography was to be inscribed on each side of the obelisk. However, instead of just one obelisk, it was decided that two obelisks, one for each lot, would be best. It is easy to forget that at this point in Mount Auburn’s history, the idea of Washington Tower was only beginning to receive preliminary discussion at Trustee Meetings. Washington Tower itself was not actually completely until the year 1854. So, when the two families decided in 1848 that they would erect not one, but two obelisks on the edge of Mountain Avenue, the Cemetery likely did not raise many objections or concerns. However, when the two Quincy granite obelisks were delivered to Mount Auburn, each obelisk measured over 20 feet tall, making them the largest obelisks ever erected at the Cemetery. The only way to get the obelisks to the Fuller Lots meant carefully pulling the massive monuments through the recently rebuilt Egyptian Revival Gateway and then traversing the Cemetery’s winding roads and paths without damaging Cemetery property. The fear of damage to Cemetery property during this process was so great that a special permit was issued by Mount Auburn to the contractor. The permit granted the contractor permission to transport the obelisks within Cemetery grounds as long as the the contractor’s firm was able to cover the cost of any damage made to Cemetery property while transporting and erecting the obelisks. Fortunately, the obelisks arrived safely at the Fuller Lots and despite significant difficulty in creating stable foundations for the two monuments, work began immediately to erect them. 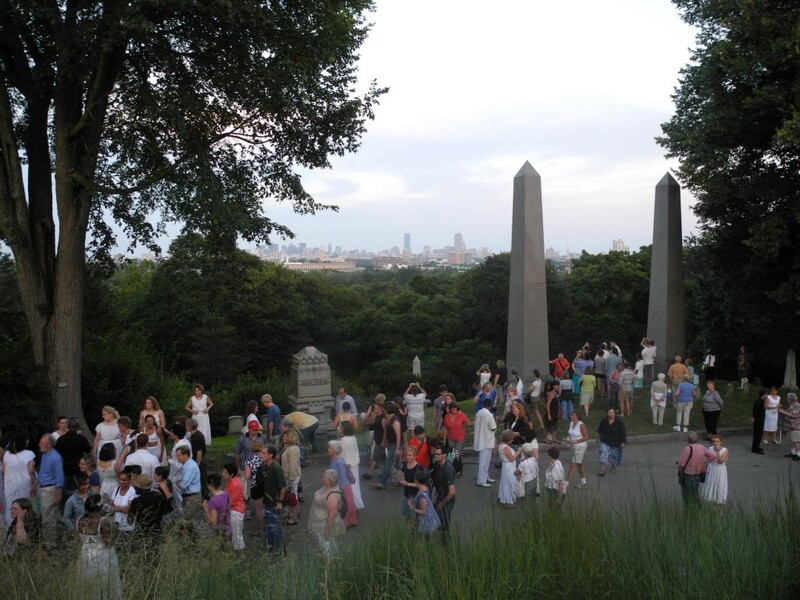 Once erected, the stately obelisks proved to be well worth the effort, as they beautifully framed the Cemetery’s infamous view of the Boston skyline. 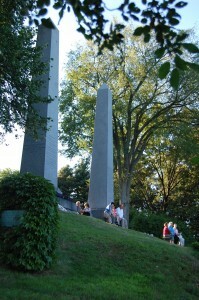 More than 150 years have passed since the obelisks arrived at the Fuller Lots and they are still as formidable now as they were on the day that they were erected. 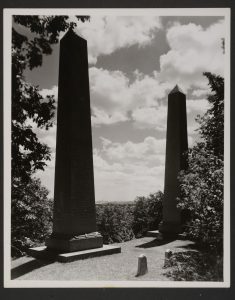 Due to their location and sheer size, the Fuller obelisks have become some of the most iconic and irreplaceable features of Mount Auburn’s storied landscape. So the next time that you visit Washington Tower, be sure to take a closer look at the Fuller obelisks, relax for a while on one of the nearby benches and take in the amazing views! Very interesting — have not really thought about the obelisks but will take much greater note of them next time I am in the vicinity! It’s time we revisited these monuments and enjoyed the view again. Thanks for sharing. Such a great 21 century picture of a man resting at Fuller obelisk talking on his cell phone!! !take time to enjoy the peace of Mt Auburn!!! I think that the Fuller obelisks have a very Art Deco appearance when you look at them from Palm Avenue. It’s amazing that these obelisks, erected in 1848, juxtapose the sky and more detailed tower in this way.